Indian Creek's Josie Diehl is pressured by Seton Academy's Arrion Pamon while driving to the basket during the second half of the IHSA Class 1A Third Place Game at Redbird Arena in Normal on Saturday, Feb. 27, 2016. 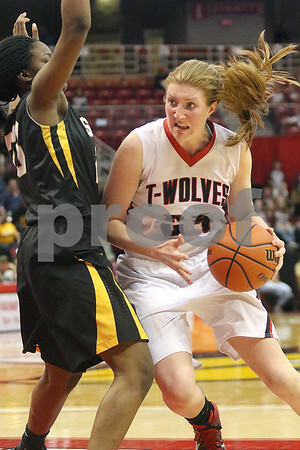 Diehl had 14 points and 13 rebounds. Indian Creek beat Seton Academy, 56-50.